Students of all age groups will be participating. “This year I’ve decided to make a few changes and come up with a theme for the show. I’ve brainstormed some ideas with students and the theme we decided on is ‘Universe’. Students can create any designs that are inspired by any ele­ments related to the universe,” explained Ms Thali. The Trash Fashion Show aims to raise awareness about waste, bringing students together to create something beautiful out of what could be considered by many as useless. Students have been putting a lot of effort and time into coming up with outfits that are made en­tirely of recycled materials. QSIP wants to avoid further waste, and once the show takes place, all the clothes made will be turned into an art display in the school so that students, parents and visitors can take a closer look at the designs. “The whole point of the Trash Fashion Show is to raise awareness about waste. We want to avoid using materials that are new and we want to make sure that once the event is over the clothes won’t end up in the trash anyway. By creating an exhibit, visi­tors will be able to check out what we have done as if they were visiting an art gallery,” explained Mr War­ren, the media teacher who came up with the idea of turning the outfits into an exhibit. Students of all age groups will be participating and have already started coming up with the de­signs and creating their fashion sketches. On top of that the whole school staff, parents and students are working towards saving recycled materials to use in the making of the outfits. Those outside QSIP are welcome to do the same by donating paper, plastic, bottles, bottle caps, can pull-tabs, cardboard, pack­ages, toilet rolls, corks etc. The only requirement is that the recycled materials are delivered clean. “We have been working hard to bring awareness to the amount of waste we generate and what we can actually create with it all. Students have been mak­ing musical instruments, art decorations, organisers and more with resources that would have been wast­ed otherwise. 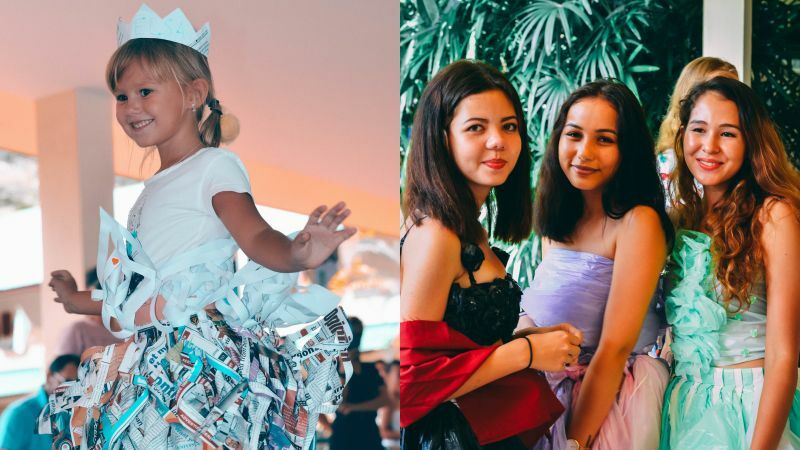 The leftover material from the Trash Fashion Show will be used to create furniture and objects for use around the school,” said Mr Peters, QSIP’s Director. The Trash Fashion Show starts at 1pm on May 3. Entry is free. If you would like to support the event by donating recycled materials, please contact Ms Thali at Thalita-simon@pkt.qsi.org or drop the materials at the school. QSIP is located at 81/4 Moo1, Chalermp­rakiat R.9 Rd, Kathu, Phuket, 83120.